AUDIO FORUMS >> DECFEST >> Zenfest, an early report. Title: Zenfest, an early report. Well I arrived around 11:00am Friday, and left about 2:30pm Saturday, I wish I could have stayed longer. Anyway the verdict on the mono's is that they are a wonderfull success, the same basic sonic signature of the Select but more punch and detail. Evidently the regulator helps with transients in that it can help deliver instantaneous voltage and current, kind of like a smart capacitor. So it was my favorite Decware amplifier of the fest. We used a CDP that Steve added a tube buffer stage to, I believe it was a Tascam. I found it to sound very nice as good as any CDP I have heard, but the most expensive CDP I have auditioned was only $5K, so I haven't experienced high end digital like Randy. But it sounded very good to me, I didn't detect any harshness, and when it did finally play one of my CD-R's (It didn't want to the first two I tried) then it sounded really nice playing one of my CD-R's from an LP. My favorite speaker was this new speaker using two fostex ( I think they were the FE167 drivers). The drivers were arranged in line vertically, the top one had its whizzer modified, and a foam phase plug, the bottom one had its whizzer removed and a new black dust cap installed. The cabinet was about 3' tall, 8" wide by about 14" deep. On Saturday they disappeared so I don't think I have a pic of them, perhaps someone else does. The cabinet is a transmission line, ending in a passive radiator. The sound is very smooth fairly efficient and a what I liked best has a very lively sound with excellent imaging. Had I the money and the means these guys would be in my rent-a-car's trunk right now! These are destined to become a legendary Decware speaker. Oh I forgot to mention the bass, they have very nice strong clean tight bass, typical of a transmission line. Steve said that if he recalled correctly the bass goes down to about 28Hz (that is if I recall correctly what he said), and I don't doubt that in the least. And the imaging, I almost forgot about the imaging, they basically disappear, with good depth and focus, not overly focused to seem unnatural, but the toe in and toe out can help dial in much of the imaging. I didn't get a chance to hear the Zpod, like I would have liked. I fell in love with Steve's new ZTpre chassis, it is not only extremely functional it is very cool looking. He is using the same style chassis for his new home theater amp prototype, five channels using EL34's. I have pics that I will post when I get back to California after Monday, I also took some video I will eventually post on youtube if it turned out OK. I enjoyed ever so much meeting so many fellow Decware enthusiast. In all everyone was very friendly and made my wife, son, and I feel so very comfortable and welcome. The food was awesome!! Thanks Devon!! Like many other fests I have attended and hosted I found I had a great deal in common with so many people, but this one more than any other I have ever attended. I want to personally thank Steve, and Devon for their hospitality. I didn't expect for us to basically to have the run of Steve's shop, it was really cools looking over the assembly benches. Oh and I didn't touch anything, although it was tempting. I got a lot of good ideas on what I could do to better organize my bench, and to make some generic PCB's for test tube circuits. I will report more later but this hopefully will be a little fix for you all that are anxious to hear about the event. I know in the past after three days had passed I wondered why no one was reporting. Now I know, everyone must crash from lack of sleep, they were up until 4:00am Saturday morning listening to stuff. Title: Re: Zenfest, an early report. Julie and I just returned from Zenfest. Unfortunatly, I have a couple of meetings on Sunday, which prevented us from enjoying Saturday night FESTivities, or posting in detail tonight. Sorry. Of course we had a great time, meeting old and new friends, listening to a lot of new stuff, and just hanging out. Thank you Steve, DeVon, Bob, and the Decware crew. We will join in on the forum tomarrow. To our friends still enjoying the fest, be careful going home...it's big out there. Thanks for the report, Terry ,et al. Any approx. dimensions of the above speakers? If you read in my above post I did mention the approximate size of the speakers I talked about 8" wide, by 3' tall, by 14" deep. I think there were pictures of them from last years 'Fest. One thing I forgot about was on Friday night Steve did a little Home Theater presentation, which included some stuff from the Blueman group, and a few animie shorts. It included his Acoustats as front right and left speakers, his corner horns in the rear surrounds, and two book shelf speakers the DM944's I think as a reflecting center channel. It made use of his Optima video projector, along with all tube channels, and the Imperials as subs I think. I just have one word to discribe the system and the experience, COOL! I believe that the speakers you are referring to are that of the Deckert/Ziegler RETAIL line. If so, what you described seems to be that of the 'KADENCE' models. I have had a set of these in my system now for almost two years. These are incredible speakers that I personally have deemed among my favorites. They are everything as you described for sure! These are now used as my main speakers, which overall, do everything right from low frequency extension to virtually perfect imaging, with a disclosure of micro detail present in the music that most speakers just do not portray. The only type of speaker that I've compared to these which are capable of revealing this level of clarity, detail, and focus, are those of single, full-range drivers such as the DFR-8 in the NFX design. The cylinder type radial designs such as the 1.5's come very close to this degree as well, although they are a very different type of speaker and quite unique within parameters that no other design can approach on the same level. When considering overall performance factors, that is where the similarity ends. While the NFX for example, produces reference grade imaging qualities with unprecedented ambience while using the modified Fostex DFR-8 drivers, the bass is very limited and falls short in that area with this type of design. The 'KADENCE' design takes that same 'unrestricted' imaging quality, and produces a superbly controlled bass response which extends effortlessly into the lower frequency registers, usually not present within typical loudspeakers. The main factor to consider here is that not only is the lower frequency factor present here in abundance, most importantly is in how it is ‘presented‘. The transmission line design works so very well with a speaker of this type. One cannot really categorize the radial design among other speaker designs because of the very fact that they are so unique in what they do. There is a major difference between a 360 degree ‘upward’ firing approach, to that of a more traditional ‘forward’ firing driver technique. This alone sets the standard into two totally separate categories which really hold no similarity in the grand scheme of things. If you like the presentation of the radial design, but prefer the more traditional forward driver ‘direct’ focus design, the Kadence speaker is perfect for delivering comparable sound qualities with an extension of controlled bass response that leaves nothing to be desired. I like both types, but I find myself listening to the Kadence designs more often than I do the radials. Room set-up has allot to do with this, as it does take a considerably more balanced set of room acoustical factors to make the forward firing driver designs perform without the distractions of common room acoustical anomalies. The radials are more forgiving in that regard. Within a well ‘controlled’ listening environment, the Kadence speaker is simply incredible in it’s ability to present a well focused soundstage, with absolute control across the musical spectrum. The layers of detail which flow from these speakers will have you re-experiencing your music with nuances that were very likely unknown in the past. These are ultra revealing like the DFR-8 single full range drivers. This can be good or bad, dependent upon the quality of your source material. Speakers on this level will indeed reveal and expose what your system is really capable or not capable of! Although I have not personally compared these speakers with the single driver ‘updated’ HDT design, I would speculate that these too would place within this category. I am in the process of assembling the HDT cabinets with the single driver DFR-8’s and the updated passive radiators. Once these are complete, I will be evaluating their performance against the high standard which the Kadence designs portray. It would be my guess at this time, that the HDT’s will be very similar in regard to performance. However, that remains to be evaluated which I intend to compare these very different design signatures. The overall concept of this speaker design captures the best of both worlds and integrates these attributes into a well built, reasonably sized cabinet design which I think is an example of excellent form and function. One that becomes a reference standard for other designs to be compared. The dual Fostex were one of the top 3 of the entire show. If I had only heard the new Zen monblocks and these speakers, and nothing else, it would have been worth the 12hr drive. But Steve also suprised us with his Open Baffle speakers! The Imperials matched-up suprising well with them. Eds horns were "A+" as were the new prototype 167e + Radial driver speakers, Even Dave @ Parker Audio brought a pair of fantastic prototype speakers with a fast ribbon tweeter! What a great time! Thanks for the update. 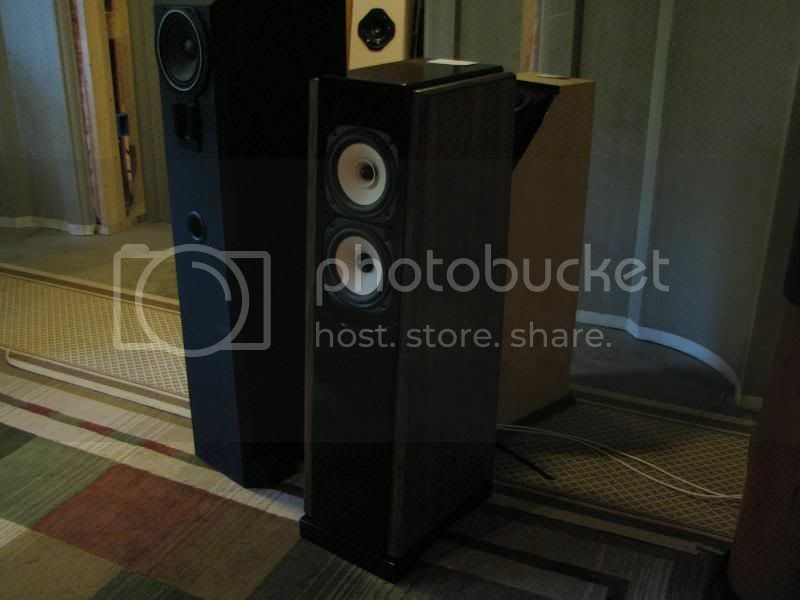 Those are the Kadence speakers pictured. Absolutely wonderful speakers to say the least! It would have been nice to attend but this was just to impractical for me to travel that far and take the time to do it. It is great that the others including yourself did make it. I'm sure that this will give you a much more solid foundation on the design philosophy for Decware and it's products. I have already been well introduced to the majority of the product line by personal experience, as most of this would have already been common knowledge for me. I would have liked to hear the new 'open-baffle' speakers and the new mono-blocks. That would have been my primary objective other than socializing. The surround channel set-up that Steve is working with also intrigues me, this being something that I am seriously interested in. Was there any mention or demonstration of that? BTW: The dimensions for the Kadence are: 38" T by 10.5" W by 12" D *(at the top). They are a slanted design which allows the proper degree of driver alignment within the time response. Therefore, they are deeper at the bottom with a progressive slope upwards. The top peaks at 12" deep. I use them directly onto the carpet without spikes with excellent results. As far as I'm concerned in my set-up, they are perfect for my tastes. Bass detail is very well controlled, tight, and fast without a trace of bloating or boom. I would never consider adding an additional subwoofer with these as it would be redundant and unnecessary. Here is a clear view of the Kadence RETAIL speakes. From the pictures Buzz posted it appears that the RL-3 no longer have the added tweeter. Or am I missing it? That speaker that buzz posted a picture of is a one-off that BobZ built this year before hornfest. I had the pleasure of hearing them there and I think I will be ruined for life if I ever want to hear good sounding speakers again, lol. 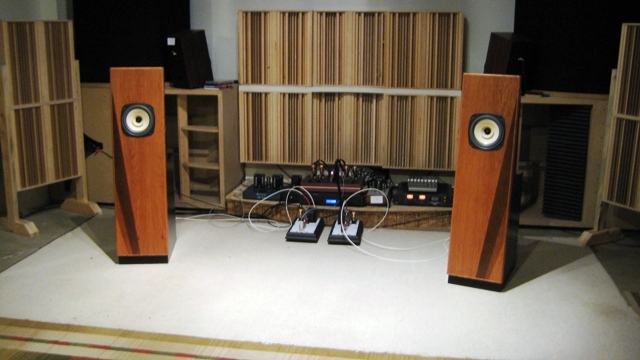 Those are (to me at least) the sweetest sounding speakers ever. RFZ quests description of the Kadence speakers is dead on. They do deliver everything so well. I wish I could sit for hours and A/B these two sets and just try to make a decision lol. Yes the speakers I was talking about are the KADENCE. I don't see them on Decware's site, but if some have had theirs for two years I am beginning to wonder if they are still in the "feeling out the market" phase of their marketing. I really really liked them, we need more speakers available with this level of quality and detail. They are very fast speakers, just the kind of sound I like, my speakers are much like them. I really liked their bass, deep quick, and I didn't detect any wild frequency dips or bumps. BTW, I am restricting my comments on this forum purely to Decware products, anything else we listened to at the fest was suppose to be for the purpose of seeing if and how compatible they were with Decware products of interest. In all I was very very happy with what I heard at practically every turn, this trip convinced me that Steve is continuing on the road with the type of sonic signature I like and pursue. I wish I would have brought a few of my components to see how they fit in and worked with various other components. Validation and confirmation are wonderful things I take away from events like this. I am not one of those guys that thinks I am hearing something that everyone else should, I question my ears constantly to the point that I am neurotic about it. When I first got there I had to interrupt Randy (In a conversation with someone else, sorry I was so rude.) and ask him to stand in the sweet spot and ask if he heard the same thing I was (The soundstage was pulling to one side for some reason). At this point as much as I want a friend more local to share audio with, I feel guilty for the amount of good audio friends I have via long distance, no one deserves to be this fortunate, money can't buy things like this, you guys are the greatest!! The reason that you do not see anything about the Kadence speakers on the Decware site is very simple. As the description reads, these are from a marketing line-up designated under the DECKERT/ZIEGLER RETAIL LINE WHICH IS SEPERATE FROM DECWARE ITSELF. I am not authorized to disclose any more details about this line as it is a future project still in the works. Bob or Steve would be your direct source of information about this at this time. Dealer networks are in the process of being developed for this line. This is why the Kadence and the other two new designs are dubbed RETAIL VERSIONS ONLY. It will not be long before these become available. Word will get out when the appropriate time has evolved to do so. Decfest just opened the doors to give you a little taste of what's to come. Being retail means that these will be sold from authorized dealers in actual audio stores. This opens up and expands the opportunity for more people to actualy audition these in person before they purchase. Many new and exciting things are about to develope in the near future. Until this all comes into play, everyone interested is simply just needing to wait until then for these speakers to become available. The reason that I have had a set of the Kadence speakers for what is actually around 18 months, is for very good reason. I own the actual prototype set that brought life into this new design. My job was to live with it, test it thouroughly in comparison to other speakers in the line up and provide feedback for the final production model. I made this clear about these speakers along with the new Retail Radial design during last years Decfest. Yes, I also have a set of the original 'prototype' RETAIL RADIAL models in finished form. These have had slight cosmetic changes done to the latest design seen at this years event. There have been some updated upgrades as well on the new radial design since I recieved my evaluation set. It takes time for a new line-up to develope. It didn't happen overnight by some magical wave from the fairies wand a week before the fest! I can assure you that this line up is only beginning it's journey, let alone any sort of dissapearing act any time soon. The open Baffles have been mentioned several times in this thread, and for good reasons. They had a sound all their own! Late Saturday night, my friend Josiah put some White Stripes on the cd player. As much of a Stripes fan that I am, I avoided playing em because I figured their recordings weren't the best for demonstrating the capibilities of the Decware line. I came into the room and sat down, rather casually, but was very soon drawn into the music. After a few songs, we began to converse about where we heard the drums, or where Jack White's guitar amp was sitting. It was nice to sit in the studio with the White Stripes for awhile. One song, the image drastically changed, and it sounded like I was in the back of a 30ft room while they were playing in the front of the room. It was so engaging! This is all saying nothing about the tonality of the speakers. Overall, the tonality was excellent. It was very balanced and nuetral from the midrange up to the high frequencies. The bass left something to be desired. It sounded like a 3 way with the woofer disconnected. Now to give you an idea of where I'm coming from, Randy said a quote, "Bass is like meat, it provides the foundation for everything else". I countered with, "Bass is like meat, what else do you need?" So for a recovering bass addict, it was far too thin. However, the imperial SO's sitting behind the OBs blended so smoothly that you couldn't tell they were on! If you walked into the room, not knowing the setup, you'd think the OB's where flat from 20-20000k. You couldn't tell when they were on, but you could tell when they were off! The imperials were being driven by a solid state amplifier, signal split off the pre-amp while the OB's were being driven off the new Mono's. It was a new level of audio achievement that has kept me from listening to my own setup for the past 2 days in fears of it sounding broken. We'll see when I set it back up tonight. I switched the OB's for the Radial 1.5's and the difference was astounding! Bob (Zygi) suggested not to immediately contrast to highly different speaker pairs like that, but to give my mind time to readjust. All in all, the OB's with the imperial SO's was a mighty fine combination, and I enjoyed some studio time with a great rock duo. Maybe someday they'll come play at my house. Was there a picture of the new Open Baffles? I was wondering the same thing... then i caught a snapshot of them from one of Steve's post in a different thread. I sure would be more interested in details :) very nice looking! Yes, they look great. Any plans for, er-- plans? I downloaded the pictures form my camera, here are ones that aren't duplicates of others. You would never know from looking at it from the outside what is contained within, but I have a feeling Steve likes it if not planned it that way. For those of you that have not met Steve is is a soft spoken man, who is very interesting. I spent a lot of time sneeking up in already ongoing conversations between Steve and others, and would listen in just to learn more about his thoughts and ideas. This is Steves test bench which is wired to the listening room behind the wall, you can see a CSP1 built into the wall and a Zen amplifiers hanging there. Behind the equipment was a black panel of connections for the speakers in the adjacent room behind the wall behind the bench. Just to the right of the test bench was the holding area for various speakers, and you can see the entry door in the background. Pictured from left to right: Openly_baffled, Bob_in_StLouis, Dennis I forgot his moniker, and lastly Randy. Notice how Randy is show casing his favorite beer, he really savors these things, sipping on just one for hours, it is a good thing his favorite beer taste good at room temperature. Trivia for those NOT at the fest. Who whore this shirt at the fest, and what amps is this schematic? I will give progressing clues if anyone wants to have fun and guess. I have some video in a week or so perhaps I will have it edited and uploaded onto YouTube. Good pic's of little red X's, sorry but the pic's are not working. If the pics don't show up it is because the webspace I have them on has exceeded it bandwidth limit. You then need to wait an hour and they should be visable again. If this continues to happen and more people have difficulty I can reduce their size and then perhaps this will not be a problem any longer, but I wanted to keep the pics as large as possible meaning that their would be more data transfer, meaning that the possibility of the webspaces data transfer limit may become exceeded. Probably after today this will be a moot point. Terry (or others), what did you think about the sound of the OB's and the Kadence loudspeakers? The OB sounded as you would think... fast, detailed, but lacking bass. The Kadence was very well balanced, detailed and fast. BTW the divers in the MTM are not the ones you linked to at parts express, Bob told me what they were but for the life of me I can't remember. To me, an Extra Stout just isn't a Guinness..
Is it my eyes or can I see the OB having a built up box section half way down. Was there an intention to have a downward firing bass driver there? Not a clue who is wearing the shirt. The amp is easy - Fender 5F1 Tweed Champ. Randy saw how disappointed I was that there was no Miller High Life Light at Decfest... you know it IS the champagne of beers! Randy, I'm quite surprised to hear that, truly the only people that I know that drink it (here) are the Caribbean community. I sure didn't see a trace of it in Ireland, but whatever, to each his own. I'm not a fan of it myself but then you learn something every day. Many thanks for the link - Will have a read at it - I don't know how I missed it. Hey your not suppose to guess if you were there. Oh well Jason had a cool shirt, and I thought the trivia would be fun. I don't know why but everyone was exactly how I imagined them being in personality, and I enjoyed getting to know a few I never knew before. I brought some Miller High Life, and it was gone as soon as I turned around! Guess someone else there liked it as well. Why does this thread have a star just before its subject line? Also there was some very nice beer similar to St. Pauli Girl at the fest that ticked my taste buds quite well. With the help of the vids pics and stories I can go places I doubt I will ever be able to go! No, I have been rather busy, just Monday I had a wood shop accident that is going to keep me from working until at least next Monday. Perhaps if I feel better tomarrow I will be able to work on it, but don't count on it. I can't type with my left hand. I hope everything is alright and your rolling in the sawdust ASAP. My wife had some pretty nasty arm surgery about a week ago and is just starting to be able to use her hand a little. She can't write or type or anything but true misery is when she goes to rehabilitation. I was down one entire arm for a week as well a few years ago and I had to be creative like placing the stapler on the shift key to capitalize. I switched to the on screen keyboard pretty quick. I could use my fingers in a week I just could not move my arm for a couple weeks very well. I saw what my Brother in law can do with one hand and a hook and before the hook he built an entire cherry wood trunk with one hand and a stump. Its a reminder to be creative with whatever you got left. Hope you heal up fast Terry and sorry to hear about your injury. I guess I should have been more specific, as I got a call from a fellow forum member wanting to know how bad my accident was. I was runnin a piece of wood through my jointer and it kicked back, throwing my finger into the blade, and it shaved off my finger print. Not bad really, it could be worse but I have to lay off of it so it heals faster. If it was a right-handed injury, you're a lucky duck, Terry! You can pass away the healing time practicing a couple of nifty piano concertos written for the left hand, only, (the Ravel and Prokofiev come to mind). Or, if you give them a listen your right hand might not twitch as much. Glad it wasn't more serious. Minor but unfortunate just the same. something that simple can keep a person from their regular scheduled life as well. The longer you give it a rest the faster it will heal is a good motto! glad your healing up! Keep it clean and clear of infection. If you let it get infected then you have a bigger problem on your hands. Hope it heals quickly Terry. I did the exact same thing about 30 years ago. Had a thumb that has about 1/3 the meat cut off where the thumb print should be. It all grew back with time, can't even tell which thumb it was now by looking. If I recall it was a combination of a jointer that wasn't as sharp as it should have been, a work piece that was too small to be safely used on a jointer, and too many beers. Havn't used a jointer since.